First of all, how cute and retro-looking is Benefit's packaging? And in dinky little mini bottles? Anything that comes in a miniature version is adorable, isn't it? This limited edition 6-piece intro kit from Benefit's b.right! skincare range, contains a cleanser, an exfoliator, a toner, a facial emulsion, a face cream and an eye cream. Oh, and the scent... Aah! A very fresh and clean cucumber fragrance. I'll start with the first step, the cleanser: Foamingly Clean Facial Wash. The word "Foamingly" in the name put me off, because I never tried a foaming cleanser that I liked. The thing is, I like my face to be perfectly clean, but I don't enjoy that tight feeling that these types of cleansers provide — a.k.a. squeaky clean. I'll stick with my balm and cream cleansers, instead. I usually prefer chemical exfoliants to physical ones, with Glycolic and Salicylic acids, but I do try some once in a while — like Korres Wild Rose Exfoliating Cleanser, which is really delicate and does an amazing job at cleansing the skin. b.right! Refined Finish Facial Polish has quite a grainy texture. In fact, I feel that the grains could be smaller, so that the product would work in a gentler manner. Having said that, this product does take care of dull skin, improves dry patches and provides an overall radiant finish. With natural clay and seaweed extract as a part of the ingredients list, this formula does the job when it comes to purifying the skin. I like to massage it in, very gently, and then leave it on for a couple of minutes before rinsing, enhancing the final result. 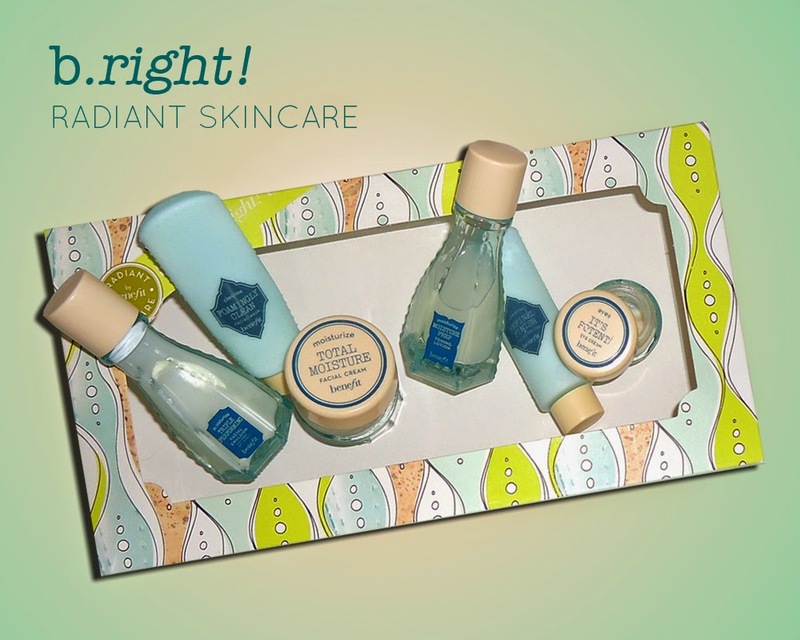 I love hydrating toners, they're so soothing and relaxing, especially when they carry a gorgeous scent like b.right! Moisture Prep Toning Lotion. The consistency is just perfect: not too watery nor too thick. Just right. Smoothes the skin and works as a primer before moisturizer, helping to improve its benefits. Benefit's benefits. Sorry, had to say it. Anyway, having a look at this product's ingredients, I realized that most of them really do belong in the moisturizing and soothing categories: glycerin, oat extract, aloe leaf extract... Oh, and I should mention that this is the kind that you pour in a cotton pad and sweep all over the face, instead of spritzing, in case that's a deal breaker for you. Triple Performing Facial Emulsion is an oil-free facial sunscreen lotion, with broad spectrum SPF 15. A good one to apply in the mornings, if you're on the look for something lightweight, soothing and ideal for dehydrated skins. Works well under make-up and did I mention, has a lovely smell? The sun protection might be enough during winter and if you work indoors, though I wear a base with SPF on top. b.right Total Moisture Facial Cream is a heavy-duty, concentrated face cream, ideal to use when your skin is feeling tight, dull or uncomfortable. I like to use this at nighttime or properly taking advantage of its hydrating formula after pamper sessions. During application, your skin feels immediately quenched, soothed and spoiled, really. With an exclusive tri-radiance complex, that aids in the process of developing the skin's own reserves of water and reinforcing the skin's moisture barrier. If you have trouble with a particular foundation that doesn't sit well on those irritating dry patches, use this as a primer. Works perfectly. I saved the best for last. A proper eye cream for dry skins: It's Potent! Eye Cream. Aah, the eyes... The real problem area for me. Not only I have to deal with concealing and brightening (seriously) dark circles, but my skin gets really dry. The eyes really do show everything, whether you're sick, tired, upset... So, before considering the proper camouflage, think about prepping the area with a nice, potent cream. The peptide complex in the blend helps to rebuild skin's elasticity and a mixture of hydrating botanical extracts protect the skin from free radical damage. Amazing during winter months or to prevent dryness caused by air conditioned areas. I'm getting my hands on a full-sized pot of this!